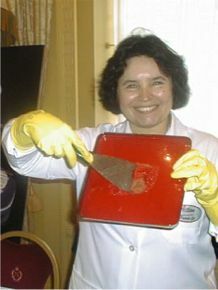 British Female Inventor of the year 2002 was won by Ithiel Mogridge, director of Action Products Ltd. with her invention of Safer* Paint and Varnish Remover. The company was established by Mrs Ithiel Mogridge who strongly believes in creating products that work as well as well-known high street alternatives but do not harm the user or their working area. Ithiel witnessed first-hand the dangers of toxic paint strippers in her role as an industrial chemist at one of the countrys largest manufacturers. Ithiel used her own tools and research facilities to develop effective alternatives. The completely non-toxic Safer* Paint & Varnish Remover was Action Products first success story and earned Ithiel the British Female Inventor of the Year award in 2002. This was followed by a water-based Artex removing gel, which gained Ithiel praise as runner-up in the category in 2003. To this day, Action Products is committed to developing capable products which are, first and foremost, Safer*, environmentally friendly and non-corrosive. Designed to be kind, the full range poses no danger to the user and is Safer* around even children and pets. Action Products Limited manufactures and distributes a range of efficient and completely Safer* chemical gel paint, varnish, graffiti and Artex removers. All ingredients conform to Guidance for Responsible Public Procurement of Cleaning Products Handbook SEC(2004) 1050.
the original source is incorporated and acknowledged in any subsequent use.